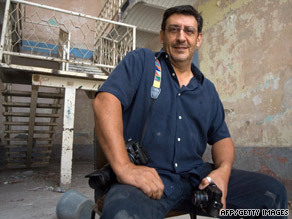 (CNN) -- Six men, including a police officer, are facing homicide charges in last week's killing of French filmmaker and photographer Christian Poveda in El Salvador, the attorney general's office said. Filmmaker Christian Poveda poses for a picture at a workshop in Mexico on August 29. The suspect accused of ordering the slaying, Nelson Lazo Rivera, was already in prison, according to a statement Wednesday from the agency. Officials gave no motive for the slaying and did not say why Lazo Rivera is incarcerated. El Diario de Hoy newspaper said he is in prison for several murders, including three slayings in 2003 known as the massacre of Samcap. Poveda, 53, had recently finished a documentary about a violent street gang, part of the Mara 18 criminal group in El Salvador. He was found shot to death September 2 in the town of Tonacatepeque, about 10 miles northeast of the capital, San Salvador, authorities said. Four of the suspects are members of the same Mara 18 gang that was the subject of Poveda's film, the attorney general's office said. Authorities identified them as Calixto Rigoberto Escobar (known as Toro), Jose Alejandro Melara (El Puma), Roberto Luis Romero (Tiger), and Miguel Angel Rosa (El Cholo). National Civil Police Officer Juan Napoleon Espinoza also was arrested, the attorney general's office said. Officials did not say what his involvement in the crime may have been. But El Mundo, Diario Co Latino, El Faro and El Diario de Hoy newspapers said authorities believe the officer told gang members Poveda was giving information on the group to police. According to El Diario de Hoy, police deputy director Mauricio Ramirez Landaverde said Espinoza was a Mara 18 member, who would drink with other members in his free time and also was involved in giving them weapons, ammunition and information. Authorities said the suspects will be charged with aggravated homicide, proposition and conspiracy in the homicide and illicit associations. Poveda's documentary, "La Vida Loca," follows the lives of members of the Mara 18 gang. The documentary has been screened at a handful of film festivals and is slated for wider release later this month. His body was found in an area controlled by that same gang, officials said. The suspects had set up a meeting with Poveda on August 30, at which time they were supposed to kill him and bury his body, El Mundo and El Diario de Hoy reported. But Poveda did not show, heightening gang members' suspicions that he was an informant. He met with the suspects three days later and was shot by Romero, El Mundo said, but in their haste to get away the gang members forgot to bury his body. A funeral for Poveda was held Wednesday in San Salvador before his body was shipped to France. A photograph of a younger Poveda, with shoulder-length hair, and a 35 mm digital camera were placed on the altar, next to a communion chalice. "This is a painful and brutal act. Unacceptable," said Monsignor Gregorio Rosa Chavez, the auxiliary bishop of San Salvador. "God moved Christian with his work, awoke noble ideals. He tried to film with his camera in order to open the eyes of those whose eyes needed opening."